What Else Can I Expect from an Online Bachelor's in Science Education Program? What Can I Do With an Online Bachelor's in Science Education Degree? What Will I Learn in an Online Bachelor's in Science Education Program? Science educators are responsible for teaching the next generation about core scientific principles and preparing them for the jobs of tomorrow. An online degree in science education can help prepare you to become a certified elementary, middle, or high school teacher. According to the U.S. Bureau of Labor Statistics, job growth for teachers is expected to be about 6% between 2014-2024, which is close to the national average. However, science teachers in particular are in high demand. In fact, many parts of the country are experiencing a shortage of science and other STEM teachers. 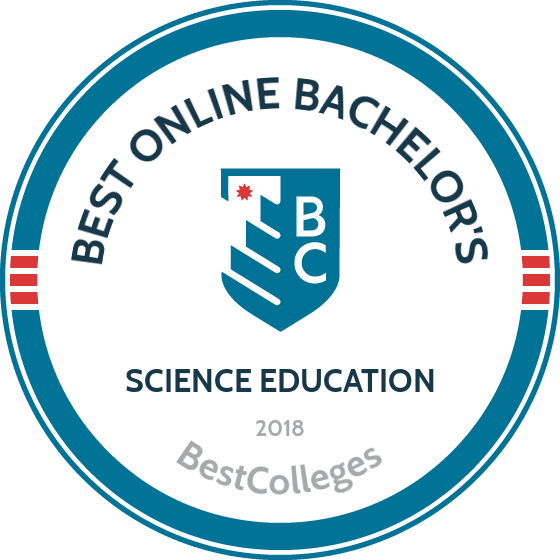 Below, we'll help you learn how to choose the best online bachelor's in science education programs for your needs, goals, and interests. An online degree in science education combines the traditional coursework of an education program with specialized scientific study. You can expect to enroll in education courses on human development, teaching methods, educational psychology, and instructional design. You can also expect to enroll in a variety of science classes, on topics like biology, chemistry, physics, physiology, and environmental science. However, each program will also have its own unique course offerings. Some programs offer classes catered specifically towards future science teachers, while others may offer concentrations in a particular age level or a specific subfield of science, such as chemistry or biology. Most programs also have generous electives policies, allowing students to tailor their coursework around their interests. The bachelor of arts in science 5-9 program at Western Governors gives students the skills and resources needed to teach young people about the world and how it evolves over time. The program, which may be completed completely online, is meant for individuals who have a science background and wish to leverage their experience to become middle school science teachers. It is also beneficial for currently unlicensed teachers, substitute teachers, and school paraprofessionals. Students can complete this online bachelor's in science education program in four to five years if they have no prior college credits. Learners who have associate degrees or transferable credits from another institution may complete all coursework in two-years. Students must engage in practice teaching, giving them real-world classroom experience and strengthening their teaching skills. The program requires students to earn 122 competency units (CUs). By using CUs, students can quickly advance through classes that they have previous knowledge of. Midway was founded as a teacher school, and its program is designed for students who want to teach middle school science. The school offers one of the top online science education degrees in the region. It focuses on training teachers for grades five through nine, with graduates meeting all the requirements to become certified teachers in the state of Kentucky. The program requires students to earn 120 credits in courses like biology, chemistry, human growth and development, and environmental science. Eighteen elective credits must be fulfilled. Students must apply for admission at Midway and apply to be accepted into the school's Teacher Education program. The university's tuition schedule is straightforward, with the full-time rate set at $11,550 per semester. Part-time students may pay a rate of $860 per credit; financial aid is also available. The program has other areas of emphasis in English, mathematics, and social studies. The science education degree online bachelor's program available through Indian River State in Fort Pierce, Florida, offers students the opportunity to take part in several different practicums in local schools. This gives them valuable, real-world experience and skills they need to become successful middle school science teachers. Students graduate from the program with endorsements in English for Speakers of Other Languages (ESOL) and reading, enhancing their value to schools and districts nationwide. Students will learn valuable skills like classroom management, how to integrate technology into the learning process, human growth and development, and more. Courses include general ecology, teaching middle school science, and biology. Learners must have an associate degree from an accredited college with a minimum GPA of 2.5. Students are also encouraged to meet with an advisor before moving ahead with the application process. Distance learners must submit to a level-two background check before completing the field experience component. Many online bachelor's in science education programs include the same core requirements and prepare students to teach at any level in the K-12 system. However, each program has its own unique course offerings, formats, and other factors that set each program apart. Below, you'll find more information on what you can expect to learn, how to pay for college, and what kinds of jobs and salary you can expect during your career. HOW LONG DOES IT TAKE TO GET AN ONLINE BACHELOR'S IN SCIENCE EDUCATION? How long it takes to earn an online bachelor's in science education degree depends on several factors, such as the format of the program and whether you plan to study part- or full-time. For reference, a typical bachelor's program with a full-time courseload can be completed in fours years. However, there are ways to reduce the amount of time it takes to earn your degree. If you have previously completed college-level coursework, you may be able to transfer it into your current program to reduce the amount of classes you have to take. There are also programs that offer accelerated formats and summer classes, which can also allow you to earn your degree at a faster rate. There are other program that allow students to enroll in classes at their own pace, with the results varying depending on the students. If you can complete more classes than normal, then you can earn your degree in less time. On the other hand, students who need to enroll in part-time courses will likely have to study for more than four years. When choosing between online bachelor's in science education programs, one of the most crucial factors of your search should be finding an accredited program. Accreditation is the process that colleges go through to ensure that their offerings meet certain standards for quality. Accreditation can be regional or national, with regional accreditation commonly recognized as being more prestigious. Regionally-accredited schools tend to be more prestigious, but are often more expensive and have higher admissions and academic standards. Nationally-accredited schools tend to be less prestigious, but often have lower tuition rates, lower admissions standards, and more flexible academic standards. The best-known accrediting bodies in the the U.S. including regional agencies like the MSA, NEASC, NCA, NAC, SACS and WASC, and national agencies such as DETC, ACICS, and ACCSC. Online bachelor's in science education programs often have education program accreditation, most notably through the National Council for Accreditation of Teacher Education. Accrediting agencies are overseen by the U.S. Department of Education (DoEd) and the Council for Higher Education Accreditation (CHEA). The CHEA is an independent, nongovernmental organization that recognizes some 60 accrediting agencies. Both the DoEd and the publish databases of the agencies that have achieved academic accreditation. You can visit the DoEd or CHEA websites to learn more. If you're dedicated, patient, resourceful, creative, and have an aptitude and passion for science, then a career in science education may be right for you. An online degree in science education can prepare you to teach at any level in the K-12 system. You can also find work in science museums, at summer camps, or an after-school programs. These educators instruct younger children, typical through 5th or 6th grade. At these grade levels, educators may be teaching students on a variety of other topics in addition to science. These educators teach 7th and 8th grade students. At this level, they teach students foundational science topics like biology and include lab requirements in their courses. High school science educators do much of the same work as their middle school counterparts, although they have the freedom to teach a wider variety of topics. High school science classes may cover advanced topics such as physics, chemistry, and more. Museum educators plan, promote, and implement activities for visitors. They may guide students through tours, hands-on activities, and more. Science educators may also perform research projects or begin conservation projects. Many teachers choose to continue their education beyond a bachelor's degree. Pursuing a graduate degree is a good way for you to earn a higher salary and advance your career opportunities. According to the National Center for Education Statistics, first-year teachers with a master's degree earn almost $7,000 more per year over their colleagues with a bachelor's degree in 2011-12. Human Development: Human development is usually a required course for all education majors. In this course, students learn about the theories, controversies, and issues surrounding cognitive, physical, emotional, and social development during the human lifespan. This course emphasizes students learning and best practices for teaching students in different age groups. Biology: Biology covers a basic survey of the principles and origins of life, basic chemistry, cell structures, genetics, reproduction, and ecology. This will likely be the first of many science courses that you will enroll in. Instructional Planning: Instructional planning is one of the most important components of a teacher's job. This course covers the best practices for designing and implementing lesson plans and investigates how student diversity impacts lesson planning, how to effectively manage a classroom, and how to assess student learning. Student Teaching: Most states require that teachers have student teaching experience to teach in public schools. This course is typically completed during a student's final year and allows them to gain practical experience in a classroom under the supervision of a certified teacher. This course is sometimes paired with a seminar component that has students examine and discuss their experiences. Many states require professional licensure to teach science courses. While the requirements for obtaining licensure vary from state to state, it typically involves supervised teaching and passing an exam. To teach science in middle or high school, you may need to pass a science-specific exam. National Science Teachers Association (NSTA): This is the world's largest professional organization for science teachers. The NSTA holds conferences, publishes journals, and advocates for scientific literacy. Kappa Delta Pi: This academic honor society is limited to exceptional students and professionals. Kappa Delta Pi holds conferences and workshops and offers resources for job searching and professional development. The Association for Science Teacher Education (ASTE): The ASTE has members around the world. They hold an annual conference, post job opportunities, offer educational resources, and more. There are several ways to get help paying for school, whether that's through federal loans, private loans, work-study jobs, grants, or scholarships. The first step in this process is filling out the Free Application for Student Aid (FAFSA) form. This is essential because some schools require that students complete the FAFSA before applying for other forms of financial aid.